In the name of security, the people of South Korea are losing a crucial element of their national identity. There is a storm raging over Seoul’s decision to “unify” history textbooks. This mandate allows only government-sanctioned content, effectively erasing any digression in the interpretation of historical events in South Korea’s development miracle. The textbook controversy does not surprise many who have condemned the South Korean state’s record on human rights violations in the past. The ushering in of democracy in 1987 promised much for the Korean people, but this promise has failed to extend to many social and political human rights – mostly due to the use of the security threat discourse. Korea’s perpetual security dilemma has inscribed particular elements to its national DNA. The result is a political system in which politicians seek regime legitimacy and social order at all costs – including at the expense of human rights. One of the most notorious proponents of this strategy was Park Chung-hee, (the current president’s father) who seized power in 1961 in a military coup. Park was the central architect of “The Miracle on the Han,” in which South Korea achieved the same level of industrialization in 25 years that Japan did in 90. But this came at a massive social cost. Korea expert Seungsook Moon has described this period of compressed industrialization as a time of “militarized modernity.” During this time, human rights were scarcely acknowledged. Workers were forced to accept dire working conditions, valued only as cheap labor. They were made to fuel an export-driven economy that was planned with military-like precision. Strict regulations were often violently executed in a similarly military-like manner. It was a place where dissenters were simply made to disappear. The Korean peninsula has historically contended with the threat of invasion. Perhaps not surprisingly, it has come to rely heavily on the idea of the “unity” of its people to mount nationalistic assaults on external threats to its sovereignty. This has created an essential need for social institutions, such as the Confucian family structure, resplendent in all its rigid, duty-bound, patriarchal hierarchy, to become intensely entrenched in the state apparatus. Today, the administration of Park Geun-hye, much like her father’s, is acutely aware of this and the political utility this legacy provides. Indeed, the current regime’s precarious tendency to stretch thin the tenets of democracy has earned the junior Park a dubious comparison to her father. But to attribute this solely to an Orwellian-esque attempt at social control or a blatant desire to resuscitate a father’s legacy would be too simplistic. Park Geun-hye has called for the teaching of a “correct history,” mandating approved content in textbooks, all under the guise of an appeal to unity. This approach has long been popular with South Korean elites as a means to reign in divergent and diverse opinions for the sake of the overall wellbeing of the nation. However, the use of “unity” is a thinly veiled attempt to shore-up political support for her national security strategy, namely the trustpolitik initiative in dealing with North Korea. Park’s regime has been quick to promote recent successes with family unifications; however, the lack of real progress with North Korean denuclearization is a perceived weakness her administration is desperate to ameliorate. Prime Minister Hwang Jyo Ahn betrayed this intention when he claimed that the current left-leaning edition of history textbooks leaves too much room for interpretation of historical events, allowing North Korea to be relieved of its responsibility for starting the devastating Korean War. Amnesty International has loudly denounced the South Korean government for unabashedly using the National Security Law as a tool for suppressing the human rights of its citizens, as well as the refusal of the state to grant adequate recognition to minority groups in South Korea. However, these criticisms are drowned out by the high volume of bilateral and regional security talks led by the United States. The U.S. sees the North Korea problem as an urgent security dilemma, and so is reluctant to criticize Seoul on human rights matters. 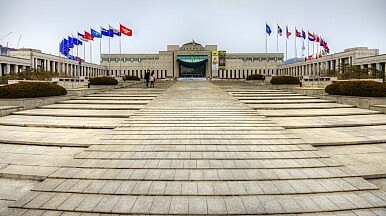 Paradoxically, this allows the South Korean state to get away with its international human rights reputation relatively intact, while simultaneously criticizing North Korea for its own human rights violations. Freedom of expression and respect for human rights norms in South Korea hinge on a paradigm shift in the perception of national security. Helping South Korea to overcome its security dilemma has strategic implications that go beyond beyond East Asia. It is a determining factor in the quality of citizenship and level of democratization that South Koreans will have access to in the future. As the regime takes yet another step towards strategic “unification,” the people of South Korea lose a crucial element of their national identity, and the state literally rewrites its sordid history of human rights abuses. Patrick Thomsen is a PhD student at the Jackson School of International Studies in Seattle, Washington, focused on international human rights norms and South Korea.